Kindness refers to the caring words and considerate actions you use to show thoughtfulness and concern for others. Kind people are empathetic. They value other people’s feelings. They help people when they are in need without expecting anything in return. When we use kind words and actions it makes the world a better place to live for everyone. Kindness is a key part of friendship. It is also a vital social skill that will help children in all types of relationships. Even when very young, children can tell when someone is in need of help and they desire to help that person! Studies tell us that in children as young as 3 years old, children really want to be kind and helpful. Researchers at Yale University (2013) set up a variety of objects such as a working marker and a dried- out marker or a working cup and a broken cup. When young children were asked to hand over a dysfunctional object for the sake of achieving a goal (i.e. the researcher wanted to be able to pour water or write a note), the children tended to override the original request and handed over the working object instead. According to Yale professor, Paul Bloom: “It tells us something interesting and important about early kindness — that when young children help someone, it is genuinely motivated by a desire to help the other person achieve his or her ultimate goals.” Children think beyond filling a request and help the person in need to reach their goal. Share abundance: Did you make cookies this afternoon? Did your garden push out a bushel of beautiful veggies or a plethora of gorgeous roses? Teach your child to think of some people who can share in this abundance as a way to show kindness. Respect the Earth: Even little children can learn about reducing, reusing, and recycling! Teach your child the many ways s/he can care for our planet. Turning off the water while brushing their teeth? That’s showing kindness to the Earth. Watering the plants? That’s also showing kindness to the Earth. Recycling a water bottle instead of buying a new one off the shelf at the store? Yes, that’s being kind to the Earth as well. Teach them to ask; “how can I help?” The household runs so much smoother when everyone pitches in. Can your child set the table? Clean up the toys her baby brother dropped? Read his sister a book when you are cooking dinner? Asking how they can help can be applied to a school environment, team or neighbor. Make it easier on someone else: Teach your children to look for ways to lighten someone’s load or make a task a little easier. If someone is holding groceries, hold the door or offer to take a bag from his/her hand. If a neighbor got your mail, offer to come over and get it rather than have the neighbor come to you. Meet someone on the bottom of the stairs instead of waiting for them to come to the top! All of these ways of showing kindness are easily done by a young child. Make Kindness a family Affair: Show your children that being a kind person is part of the value system of your family. Model kindness yourself by doing small, thoughtful acts for friends and family– and talk about how they make people feel! Kindness feels good for everyone involved! As part of “kindness month,” we like to encourage our students to generate and act on various ways to show kindness to others. Can they do 10 acts of kindness this month? 100? Random acts of kindness don’t need to take a long time or cost money. When your child thinks to open the door for another person, gives a hug to a friend or helps clean up, s/he is showing kindness! Challenge your child to do one, two or even three random acts of kindness per day- they add up! 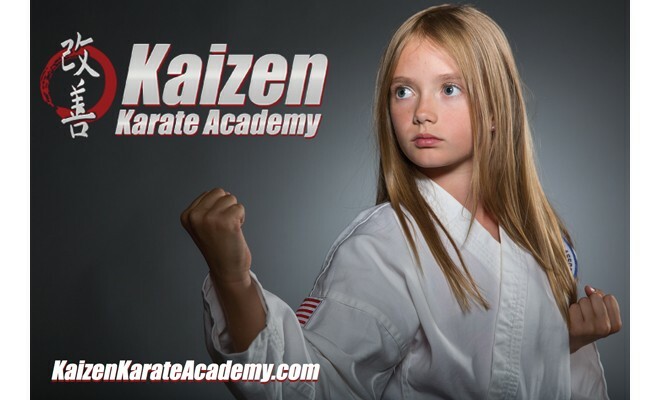 Mr. Preece is the owner and chief instructor of Kaizen Karate Academy. Mr. Preece has been teaching martial arts as his full time profession in the Dover area since 2003. Mr. Preece’s strengths include teaching both youth and adult classes. He says his favorite part about martial arts is teaching leadership skills to a new generation, as well as encouraging families to train together to reach their full potential.